I've been a little teacup obsessed lately. I have a few vintage inspired teacups that I use at home and I just love the whimsy of having tea in a different cup each day. That obsession has clearly found it's way into my craft time. Which is not a bad thing yet. I mean... I can trust you to tell me when I start taking it too far right? Right? Here's my latest teacup craziness. 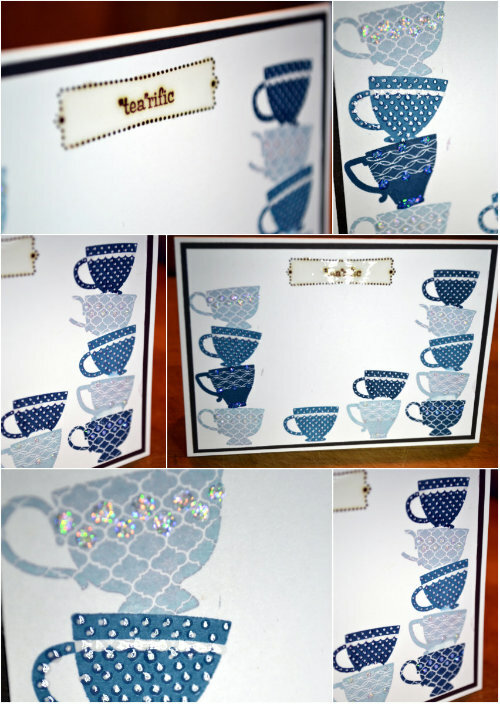 I haven't given this card away yet, but I'm thinking I should make a few more in different colours and then invite my friends to a tea party. A perfect excuse for tea, cupcakes and dressing up.